Kartini Day, also referred to as Women Emancipation Day, is an Indonesian holiday that commemorates Raden Ajeng Kartini. She was the first Indonesian feminist and is considered a national heroine of Indonesia. 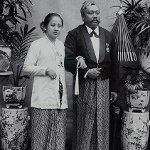 Kartini was born on April 21, 1879, into an aristocratic Javanese family with a strong intellectual tradition. At the time, Java was ruled by the Dutch colonial administration. Her father allowed her to attend school, where she learned to speak Dutch. At the age of 12, however, she had to leave school, but continued to read books to learn as much as she could. While reading Dutch newspapers, she became interested in the issues of emancipation of women and other problems of Indonesian society. She view the feminist movement as a part of wider sociopolitical movement. In 1903, she had to enter into an arranged marriage. Her husband was an understanding man and helped her establish a school for women. Kartini died on September 17, 1904, following the birth of her son. After her death, Kartini's letters to her European friends were collected and published under the title Out of the Darkness Comes Light. Kartini Day was established in 1964 by Sukarno, the first President of Indonesia. It marks her birth anniversary.